The U.S. Department of Labor's Employee Benefits Security Administration issued tips intended to help plan sponsors select and monitor target date funds (TDFs) in their investment lineups. These target date fund basic definitions will help plan fiduciaries navigate the Department of Labor Tips for ERISA Plan Fiduciaries. Asset classes are groups of securities that exhibit similar characteristics. The three main asset classes are equities (stock), fixed-income (bonds), and cash. Additional asset classes that may be employed within a target date fund are: world bond, emerging markets, and/or real assets like commodities and real estate investment trusts (REITs). In 2013, the U.S. Department of Labor’s Employee Benefits Security Administration issued tips intended to help plan sponsors select and monitor target date funds (TDFs) in their investment lineups. 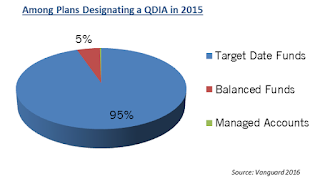 It is incumbent on plan fiduciaries to establish a process or fiduciary best practice for comparing and selecting target date strategies, especially when they serve as the plan’s Qualified Default Investment Alternative (QDIA). Fiduciaries should implement a process to perform periodic reviews to have a clear understanding of the investments and how they will change over time, and to compare the funds’ fees. Target date funds automatically adjust their asset mix to become more conservative as an employee gets closer to his or her target retirement date. QDIA is a default investment option chosen by a plan fiduciary for participants who fail to make their own investment election. The Pension Protection Act of 2006 approved target date funds as a QDIA. The Pension Protection Act of 2006 (PPA) encouraged employers to adopt automatic enrollment features for their participant‐directed plans by providing a new type of fiduciary liability relief for “default investments,” or Qualified Default Investment Alternatives (QDIAs). A QDIA is used when a participant fails to make his or her own election. An investment must have specific qualifications to be considered a QDIA. Importantly, a QDIA’s asset allocation strategy need only take into account participant age, and does not need to consider an individual participant’s risk tolerance or other investment assets. Strategic Benefit Services has created a Fiduciary Checklist for Target Date Fund Decisions. Download the attached checklist to help plan fiduciaries stay compliant and feel confident they are following the Department of Labor Tips for ERISA Plan Fiduciaries.